The passage between Bush Point on Whidbey Island and Marrowstone Island is the narrowest one in North Puget Sound and was first marked by a private light maintained by the Farmer family, early settlers of Bush Point. Each night, the Farmers would hang a kerosene lamp from a wooden gallows to aid mariners. 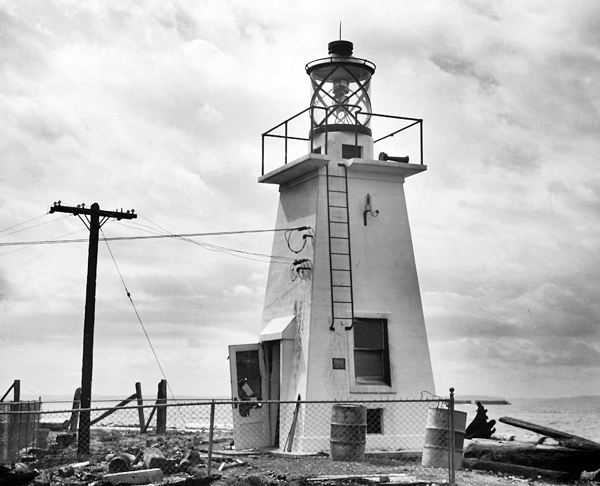 A post light, which employed a tubular-lantern light, was established at Bush Point by the Lighthouse Board on May 10, 1894. The great depth of water extending for the most part within a few yards of the shore, making it difficult to find an anchorage in thick weather. Strong, irregular, and variable currents. Thick fogs nearly all the year. Smoke from forest fires during the late summer and autumn months. 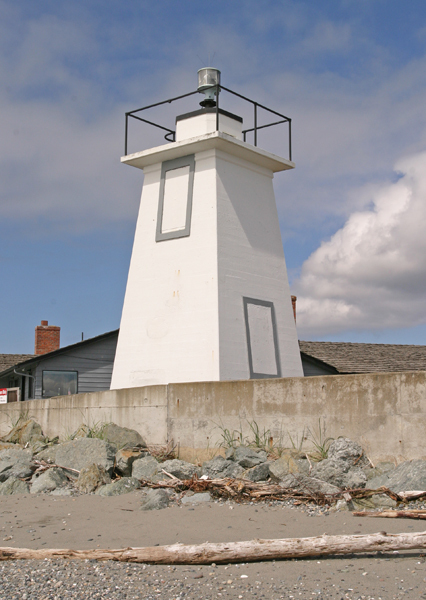 To improve navigation in the area, the Lighthouse Board requested $41,600 for new or improved lights and fog signals at six points, one of which was Bush Point. This is a low point, and the currents in the vicinity are strong and irregular. Several serious collisions have occurred between Bush Point and Point No Point through inbound and outbound vessels following the shore of Marrowstone Island during foggy weather on account of the echo which can be obtained from it. This aid was petitioned for by the Shipmasters’ Association of America during September, 1918, and was considered by that association as the second most important aid required for Puget Sound. 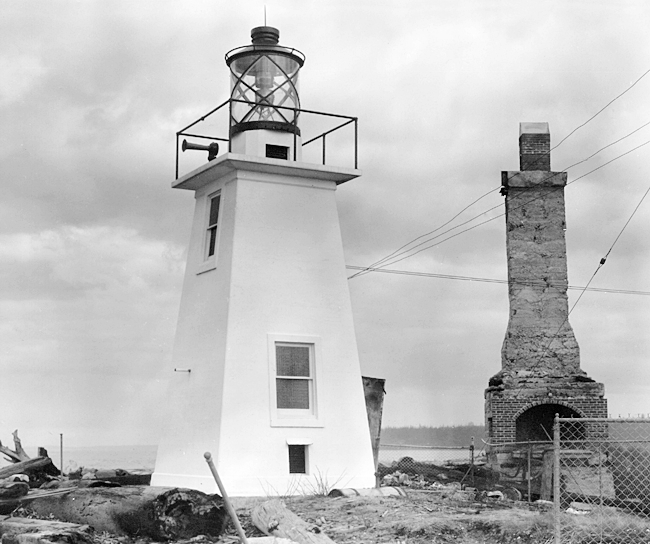 The Bureau repeated its request several times, until $10,000 was allotted in 1930 for an automatic acetylene light at Bush Point. The project was expected to be completed in 1931, but the twenty-foot, pyramidal tower, built of reinforced concrete, was not finished until 1933. Operated by commercial electric power, the semiautomatic light and fog signal were controlled from the residence of a caretaker. The total cost for the project was $6,197. The light emitted from the lantern atop the square tower was on for five seconds and then off for five seconds, while the horn mounted on the tower sounded a five-second blast every thirty seconds when needed. 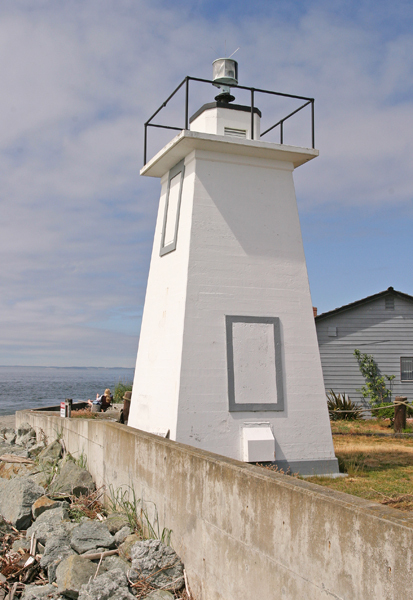 The fog signal was discontinued in 1976, but the tower still exhibits a light to help mariners navigate through the narrow passage off Bush Point. Report of the Commissioner of Lighthouses various years. 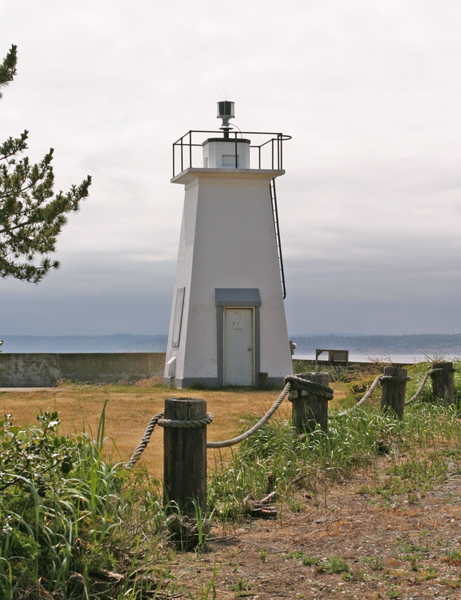 Located at Bush Point south of Admiralty Head on Whidbey Island. For a larger map of Bush Point Lighthouse, click the lighthouse in the above map. From Highway 525 just west of Freeland on Whidbey Island, go west on Bush Point Road for 2.75 miles, where the road will split. Take Scurlock Road, the left fork, and then turn left on Sunset Avenue. Turn left again after one block onto 1st Avenue, and then right onto Lake Avenue, which leads to the light. The lighthouse is owned by the Coast Guard. Grounds/tower closed.